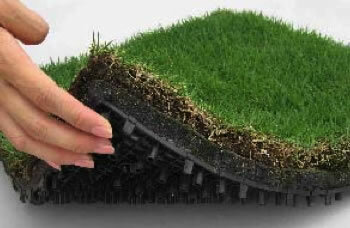 TM9 turf mats are now ready for you to buy, making that grass roof you've always wanted a real possibility. Toyota Roof Garden (subsidiary of the car company) is now taking orders for its modular grass tiles. The idea is that companies can reduce the urban heat island effect, thus cooling our great cities. TM9 roofing tiles also provide excellent thermal insulation. Individual mats are twenty inches square, and about two inches thick. The mats are planted with a special brand of Korean velvet grass - it only needs to be cut once per year. The mats are irrigation system-ready; water can flow through tubes to channels in the mats, providing moisture to roots. The price? Just $43 per square yard. I confess that my real interest in the TM9 turf mat is that I keep looking for grass carpets, as found in Kurt Vonnegut's 1959 novel The Sirens of Titan. In the book, carpets made of real grass are used to illustrate elegant living. I first read about the idea in Robert Heinlein's Stranger in a Strange Land; winchell Ben Caxton had a living grass carpet in his bachelor flat. I think that the TM9 would make a perfect "carpet square." The cost to fully carpet my living room? Just $2,400 - cheaper than laminate floors or regular carpet. And, you can occasionally tap it to keep your carpet nice and green. See the roof garden site - thanks to Edo.